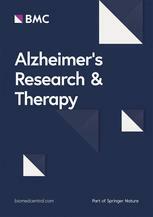 Leading the open access field for translational research into dementia and neurodegenerative diseases, Alzheimer's Research & Therapy is the major forum for translational research into Alzheimer's disease. Affiliated with Alzheimer’s Disease International (ADI), we publish basic research, as well as clinical trials, research into drug discovery and development, and epidemiologic studies. The journal offers rapid peer review with an average time to first decision within 5 weeks and publishes reviews, viewpoints, commentaries, debates and reports, as well as research articles.